A freebie is a PDF, printable, checklist, worksheet, template, email challenge, you-name-it, that someone gets fo’ free in exchange their email address (AKA subscribing to your email list). An opt-in just also a freebie, or whatever you’re using to get someone to subscribe (opt IN!) to your email list. If you’re struggling to think of a freebie for your blog, search your niche on Pinterest to get ideas – Blog freebie, or Home Decor Freebie, or Healthy Eating Freebie. Once you have your freebie nailed down, there’s a little strategy behind creating getting all the juicy data out of that opt-in that you can. 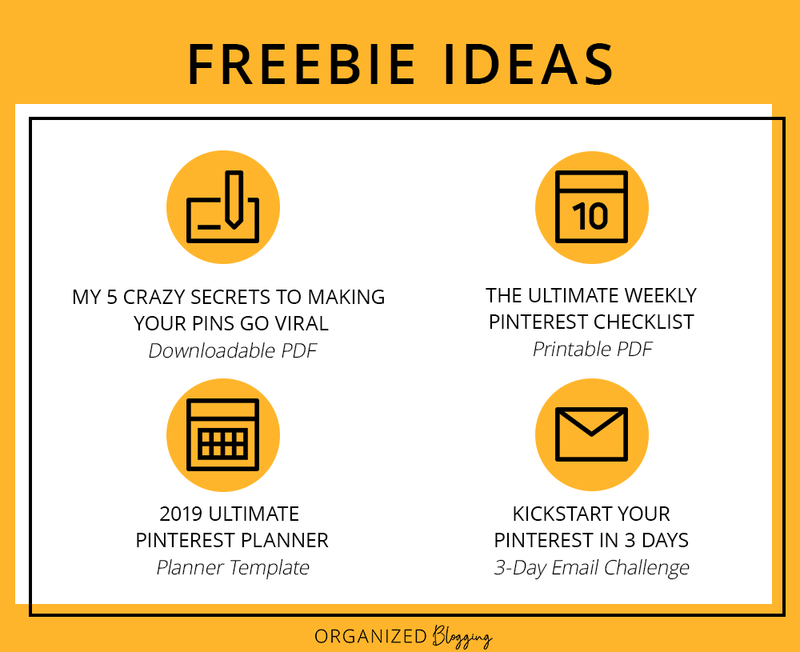 Let me show you the strategy I use for my free Pinterest Roadmap, which is a downloadable PDF (and available in my freebie library for subscribers! #shamelessplug 😉). Disclaimer: I use MailerLite to manage my email marketing, which is free up to 1,000 subscribers! It’s definitely been my favorite free email marketing platform! Despite my high praise, this post is in no way affiliated with MailerLite. It’s helpful to keep those who have signed up for the freebie on their own list so you can target them later based on their interests. For example, if I sell a Pinterest course in the future, I could send a couple extra, targeted, emails to those who have opted-in to my Pinterest Roadmap. If they opted in to that freebie, then they’re clearly looking for help with Pinterest and may be interested in my course! So, in MailerLite, I created a new “Subscriber Group” called, “Pinterest Roadmap Freebie.” This is separate from my general email list of all my subscribers. I’ve written several blog posts about Pinterest. If someone’s reading that post, they’re ready to learn more about Pinterest, so they’re more likely to opt in to my Pinterest Roadmap pop-up than my general site-wide pop-up. In MailerLite, I adjusted the settings (here’s a how-to guide) so only the Pinterest pop-up displays. Hello, conversions! Waiting for at least 15 seconds before the pop-up displays. Give them a chance to read your content and “get to know you” before asking them to subscribe. Waiting until they’ve scrolled down through at least 50% of the page. These are all settings you can choose in MailerLite. Also, here’s how to create the pop-up from A to Z. 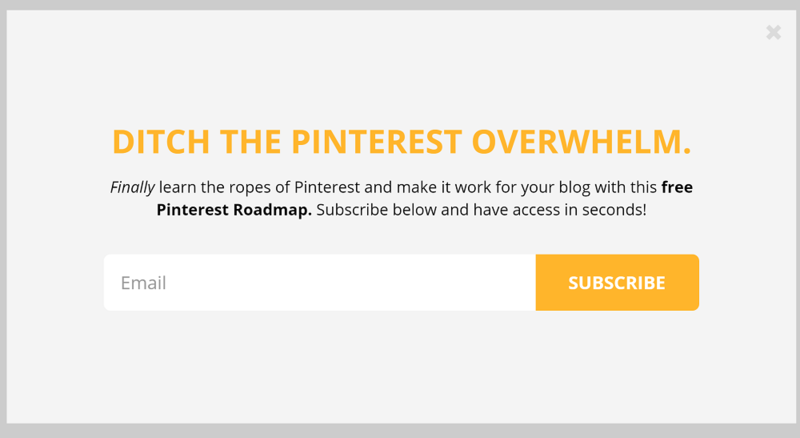 The pop-up I use for the Pinterest Roadmap freebie. Now that you have the list and the form, we need to put it all together. Mailerlite’s automation is super simple using the Automation tab. Simply create a new workflow so that when someone signs up for your new list, they’re sent an email with a link to the freebie. One of the easiest ways to link your freebie in your email is by uploading the file to your Media Library in WordPress. In the Media Library, copy the URL of the file and link a button in your email to that URL. 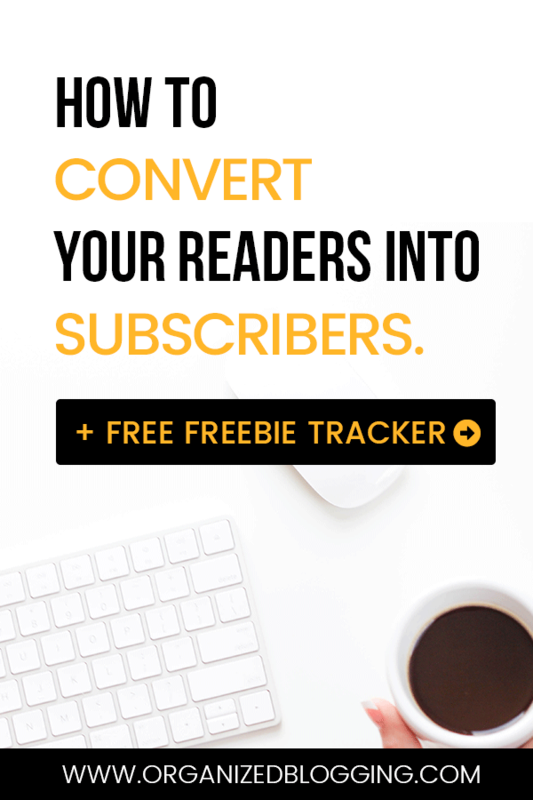 Subscriber is added to Freebie List >> Subscriber is Copied to your General Mailing List >> Subscriber is sent Freebie Email. The process thus far is sufficient to get new subscribers for your blog; however, to create a more engaged list that’s likely to open and click your future emails, we can take it one step further. See my full post here on creating a welcome email sequence for your blog! After the sequence finishes, then have the automation add them to your general list where they’ll start receiving your regular emails. This can all be done in MailerLite’s Automation tab. It’s a good idea to wait to add them to your general list until the end of the sequence so they aren’t being spammed with too many emails. Keep Track of Your Freebies & Pop-Ups! Excellent post, Hayley! And I just happen to be working on this very process right now with MailerLite, so it’s also a very timely post. I appreciate the way you add links to tutorials within the post. Then there’s no guesswork or hunting for how to actually implement your plan. Thanks for the help with freebie creation! Thanks, Kristi! I’m so glad it was helpful for you! It can take a couple steps, but it’s well worth it to have a good system in place. Best of luck!! My goodness, these are great tips! Thank you for explaining it on a beginner’s level and linking to your tutorials. Yes! Absolutely! It takes a little work, but it is well worth it! Good stuff Hayley! I saw your link in our FB group.